How does fear of epidemic disease influence the spread of disease? In the movie “Contagion” we see many examples of how individuals and governments respond to an epidemic. There is panic, people fleeing cities, people isolating themselves in their homes, governments closing borders and imposing quarantines. The tagline of the movie, “nothing spreads like fear” may actually be quite accurate. Using mathematical models to understand the spread of disease is a common tool in epidimiology. At its most basic, we can think about the spread of a disease through a population by considering that an individual can be susceptible to the disease, infected, or removed. Someone who is susceptible can become infected. Someone who is infected can spread the disease to others who are susceptible. Infected people can be “removed” from the population by either recovering and becoming immune, or dying. Either way, they are no longer in the susceptible or infected categories. These S-I-R models can become quite complicated when you begin to consider all the possible variations: how easily the disease is transmitted, how long someone is contagious, whether transmission is dependent on direct contact, etc. These models don’t have to be limited to study the spread of infectious disease: indeed, one could consider fear to be contagious. So what happens to the spread of disease during an epidemic if we add normal human behavior into the SIR model? If we consider fear to be contagious as well, during an epidemic there there would be two things spreading through the population: fear and disease. And when we fear disease we change our behaviour. In a recent paper, the simultaneous spread of fear and disease were modeled using an SIR model. It turns out that, as the tagline for “Contagion” suggests, fear spreads more quickly than disease. In their model, someone susceptible to fear can become “infected” with fear either through contact with someone with the disease, someone who has fear but no disease, or someone who has both fear and disease. Since you can only get infected with the disease by contact with someone else who has the disease, there are more ways to catch fear than disease, and it spreads faster. So once someone is infected with fear, what do they do? What would you do? My instinct would be to hide at home and remain isolated; others I have spoken to would flee to a small town in the middle of nowhere. The researchers considered that too. How will the spread of the disease change if some people run and some hide and others don’t do anything? It turns out it is best to hide. Hiding has the greatest impact on halting the spread of the disease: not only do fewer people become infected, but the disease doesn’t spread as far geographically. Fleeing reduces the number of people infected (compared to not doing anything) but spreads the disease further. The model demonstrated another important point. Over time, our fear decays. For whatever reasons, after hiding for a while, we may feel more confident about wandering out into the now hopefully less plague ridden world. Bad idea. As long as there are still some people infected with the actual disease, re-entering the world adds fuel to the epidemic by introducing more susceptibles. This causes a second wave of the epidemic. One could speculate that this could have been the cause of the two waves of influenza in 1918 – people came out of quarantine too early. 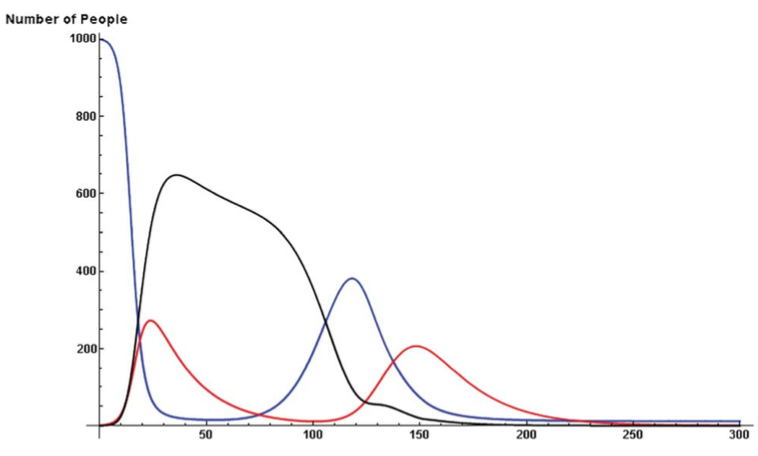 As the number of infected people increase (red), more susceptible people (blue) will hide (black). That causes less people to become infected, people become less afraid and leave quarantine re-entering the population and causing a second wave of disease. From Figure 3 of Epstein et la 2008. We had a terrific discussion about this paper in class and we identified several reasons why we though that fear would actually spread even faster than the paper suggested, and that the effects of fear (fleeing or hiding) on spread of the disease might be greater. Obviously, fear can spread without direct contact. You can get infected with fear pretty easily by reading things on the internet or watching the news. Fear of a disease could leap across the globe quickly, well ahead of the disease itself. Also, people don’t behave independently. So if one member of a family becomes afraid and wants to flee or hide, the rest of the family may do so as well. As people flee from cities, its likely that choke-points and crowds would further fuel the epidemic.